COMMITTED TO SOCIAL AND CORPORATE RESPONSIBILITY. At Upwardor®, we are committed to comprehensive social and corporate responsibility, and that dedication can be seen in everything we do – whether it concerns our employees, our community or the environment. Our Employees Are Our Most Important Resource. We understand that any organization is only as good as the people who serve in it. That’s why we put so much emphasis on helping to develop the skills of our valued employees. These efforts include both on-site training and off-site educational program subsidies. Not only does this ensure that our employees are as effective at what they do as possible, it also helps prepare them for advancement within the company. Upwardor is proud to announce the creation of the “Opening Doors for Veterans” Program, a corporate sponsorship relationship with the True Patriot Love Foundation (TPL). 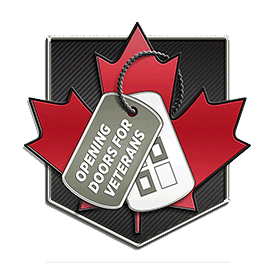 Our goal is to honour the sacrifices made by our Canadian Armed Forces by contributing funds through various internal and external fundraising activities throughout the year. The True Patriot Love Foundation (TPL) is a national charity that funds unique programs and innovative research in the areas of Canadian Military family health and support, physical health and rehabilitation, mental health and wellbeing and research and innovation. TPL is also committed to changing the conversation about our nation’s veterans, hosting multinational symposiums and organizing ambitious global expeditions. Since 2009, True Patriot Love has committed more than $15.1 million to support military charities and research across Canada. For more information about the True Patriot Love Foundation, visit www.truepatriotlove.com. Upwardor is committed to contributing a portion of the proceeds from the sale of every PowAirDor Pneumatic Operator to the TPL Foundation from January 1, 2016 through to December 31, 2016. If you would like to make a donation directly to True Patriot Love, please go to www.truepatriotlove.com and click “Donate Now”. Upwardor® adheres to the highest standards of environmental responsibility in the manufacturing of our overhead garage doors. Here are some of the areas we focus on in this regard. Steel comprises the majority of the components used to manufacture our garage doors. The steel we use is made up of approximately 50% recycled metal. Our steel supplier also participates in, and is part of, LEED® Product Compliance Canada. Polyurethane foam insulation represents the second major component of our garage doors, allowing us to achieve a high R-value, and providing our customers with an energy-efficient product. Our polyurethane foam insulation is 100% CFC free and contains Zero ODP (ozone depleting potential). Aluminum material is used to manufacture full view sections and full view garage doors. Our painted and milled extrusions contain 20% recycled content. The packaging of our products provides protection during handling and shipping. Our goal is to use enough packaging material to protect our product, without creating excess waste. The corrugated board used to protect our product is made of 100% recycled content.